Small announcement: As part of the University of Ottawa’s International Development Week, yours truly will be taking part in two events. Frist, a book reading with other “international authors” in Room 509 of the Arts Building, 70 Lauruer Ave E, on Monday Feb 4th at 4pm. Second, I’ll be part of a panel on health and development on Tuesday Feb 5th, 5:30-7:30pm, place to be announced. 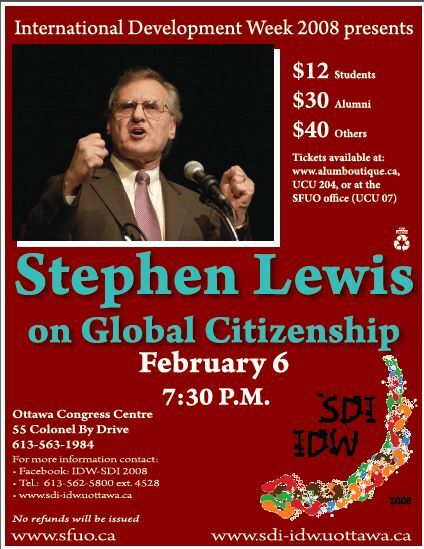 Big announcement: As part of the same event, we have secured Canada’s greatest speaker, Stephen Lewis, to give the keynote lecture on Feb 6th, 7:30pm, at the Ottawa Congress Centre. This one costs money, but I urge everyone in Ottawa to fork out the $$ to hear the man. You can get tickets online. Even bigger announcement: Just a few minutes ago, I got confirmation that Michael Ignatieff is interested in taking part in our event. Now the question is, is there an overlap between the sparse holes in his very tight schedule, and the choice speaking spots in our ever tightening schedule? I desperately hope so, as Ignatieff will add a very special –and possibly controversial– element to the festivities. Please stay tuned for more info, especially those of you in the Ottawa area. Sad announcement: One of the greats of our age, by whatever standard you apply –whether positive or negative– the transcendant and possibly undefeated chess master, Bobby Fischer, has died. The man was very possibly nuts, and his racist and anti-semitic views are not to be rationalized. But he was also brave and unrelenting and always a source of entertainment, for better or worse. If nothing else, he certainly coloured the world with his presence. I’d always hoped for his redemption, possibly with a little help from our friend Lithium; but it never came.